■Width display for the rip fence with manual fine adjustment. 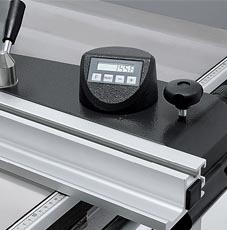 ■This electronic measuring system guarantees rapid and precise adjustment of the rip fence. ■Offers repeated accuracy: the fence can be moved and then returned to exactly the previous position. The system is immune to both wear and dust. ■Dimensions are corrected automatically when the fence is changed from the upright to the flat position.